What can I say about the Blue Jays? They've certainly had their fair share of ups and downs, but despite their struggles over the last two decades, I still stand by them. And now they have their own Alpaca Farm quiz. Enjoy. The year before the Blue Jays entered the league in 1977, Horace Stoneham, the owner of which NL team, was in the final stages of selling them to a Toronto based group, before the deal was prevented by a US court ruling? What future Hall of Famer who, after spending 16 seasons with his first team and one with another team, joined the Blue Jays where he would eventually hit his 500th home run on June 28th, 2007? The inaugural season was not without controversy, as Toronto's Exhibition Stadium was notable for being the only Major League stadium not to serve what item? Future Blue Jay superstars Joe Carter and Roberto Alomar were part of the blockbuster trade with San Diego, a trade that saw what two players, both All-Stars, made Padres? Seen here in this image sitting next to former president Jimmy Carter, these two individuals are cheering on their team at home against the Blue Jays. Identify them. The Blue Jays career record holder in home runs, RBI's, walks, and total bases, what player was awarded a 1993 World Series ring, despite not playing in the series? Christopher Lloyd's character, one of the title beings in what 1994 Disney film, first appears in a game where the team he supports faces and eventually beats the Blue Jays? Three Blue Jays pitchers have won the Cy Young Award. Which 1996 winner was the only one to win the award once in his career? Of the 15 men to have managed the Blue Jays, who was the only one to have been inducted into the Baseball Hall of Fame, albeit with another team? 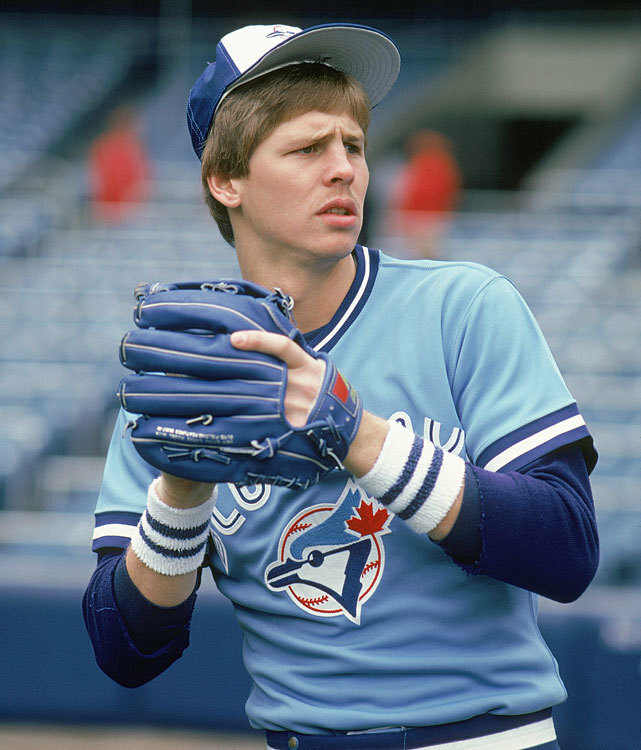 Although known more for his basketball career as a player-executive, what man, seen here, was drafted in the 15th round of the MLB Amateur Draft as a second baseman, before quitting baseball to play for the Boston Celtics? On August 8th, 2015, Justin Smoak, seen here, became the first Blue Jay to hit a grand slam in what stadium? 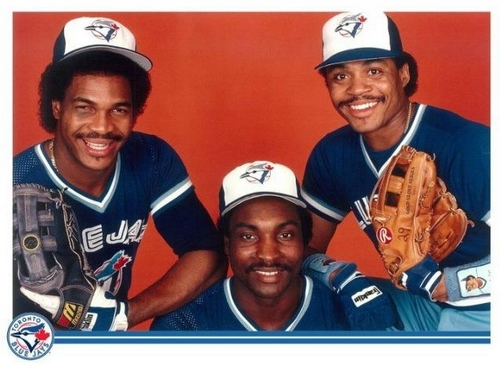 The trio pictured here, considered by many experts to be the best outfield of the 1980's, helped the Jays win their first division title in what year?